Have you always wanted to give surfing a try? Surfing is one of the fastest growing extreme sports among men and women. 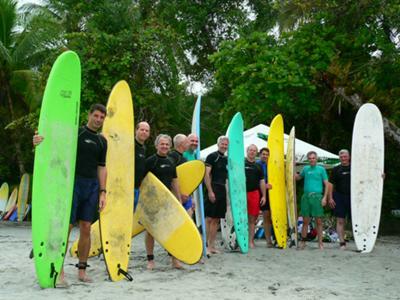 We provide individual and group surf lessons at beautiful Manuel Antonio Beach as well as other beaches in our area. Our instructors have a passion for surfing that translates into a friendly teaching of basic skills for all levels of surfers (especially first-timers!). Ninety-nine percent (99%) of our students are standing on waves in their first lessons. Our goal is to teach that surfing is an activity which includes respect and love for nature. Of course we can't leave out the entertainment factor--a very important point in our sessions and tours! 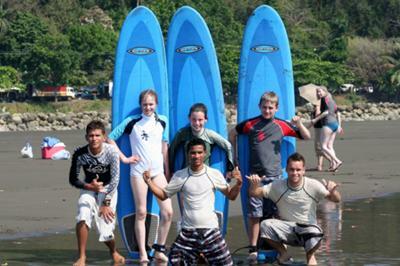 Tropical Surf School was founded in 2004, when we realized there was a need for qualified, professional surf-instruction in the Quepos/Manuel Antonio area. Many people, including tourists and ticos, have wanted to learn to surf but it hasn't been easy to find good, qualified surf instructors in the area. Now we're here and ready to help you learn to surf! 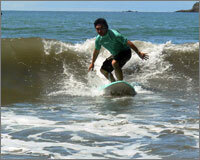 Tropical Surf School is located in one of the best-known adventure and tourism destinations in Costa Rica. Quepos is very near one of the most visited national parks in Costa Rica, Parque Nacional de Manuel Antonio. Manuel Antonio is known for spectacular coastal scenery and an incredible diversity of wildlife. Here there is a great balance between nature, scenery, wildlife, and world-class accommodation and restaurants. The area is also known for consistent waves, year-round, with options for beginners and experienced surfers alike. We know where to find waves to suit anyone; smaller waves to start on, or larger, more powerful waves for the more experienced. Plus, our warm tropical water makes it especially comfortable and easier than learning in colder water or while wearing a wet suit. Surfing is a sport that anyone young at heart should try. By choosing the right waves and with proper instruction, people of all ages and physical abilities will be able to experience this incredible feeling. If you've ever wondered what it feels like to race towards shore on a wave, you're ready to learn to surf! We start with the basics, teaching you how to enter the water, how to paddle the board effectively, read the waves, pop up to your feet, and ride the wave to the beach. Surfing is a somewhat physical sport, and we also cover important aspects such as proper warm-up, stretching, and even learning to breathe and stay calm while taking on the ocean. Also covered are the unwritten "rules" of surfing that allow surfers to enjoy the sport together. We believe our well-rounded approach is the most rewarding for everyone, and we know how to make it fun for everyone!!! Our instructors are friendly, open-minded, and extremely helpful. They have proven themselves with national competitive surfing experience, and have surfed all over Costa Rica and in many other countries. They share a passion for surfing that is as vital as any piece of equipment, developed over a lifetime of surfing. That passion is what we want to share with you. Our instructors have lived most of their lives in and around Quepos and Manuel Antonio, and know the local waves better than anyone. The Tropical approach is friendly, enthusiastic, and hands-on, which helps give confidence to our students. The fun, the adrenalin, and the thrill of riding a wave await you, and our instructors are ready to show you how! Duration: 2 hour with instructor plus 1 hour of free surfboard rental. Pick up to and from your hotel or home. Equipment (Surfboards, rash guards and leash). Duration: 1 hour with instructor. Duration: 2 hours with instructor plus 2 hours of free surfboard rental. Location: Dominical Beach | Rey Beach | Bejuco Beach | Hermosa or Jaco Beach. OUR TOUR INCLUDES: Pick up to and from your hotel or home. Our quality rental equipment includes: surfboards, bodyboards and Longboard rentals from 6 feet to 10 feet long. Location: Quepos & Manuel Antonio Beach - Costa Rica.